I used the Double Diamond research methodology, which includes points of divergent and convergent thinking. During the first half of this process, I gathered research and affinitized it into organized categories and insights. I decided to immerse myself in the industry and focus on learning its design language and vocabulary. I immersed myself into the life of the user, in order to observe their behavior and experiences. The four methods I used were: Active and Passive Observations, Interviews, and Surveys. I observed sound designers recording live sound from film sets, and recording sound effects in the field. I collected this data by taking notes, pictures, and gathering first person video footage. I asked questions along the way about their interactions with the equipment and the people around them. I observed sound designers in the recording studio, recording live sound from film sets, and recording sound effects in the field. I collected this data by taking notes, pictures, and gathering video footage. On some occasions I asked questions after the observation to clarify their reasoning. I spoke with sound design professors, student sound designers, professionals, and a key member of the Audio Engineering Society about their experiences with audio recording and their view points on specific devices. I wrote and conducted surveys to gain more statistical data. This allowed me to see rich view into the behaviors and reasoning of the user. For example, I identified key features they consider when using a recording device. 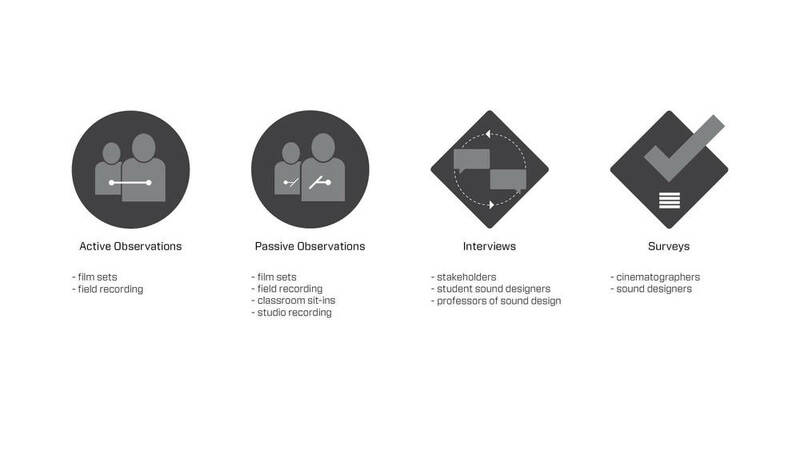 Below is a journey map that shows the user touch-points throughout the process of recording audio, highlighting specific pain points within this process. I decided to do general ergonomic tests on hands. I did this by making models of the two most popular devices on the market and sliced them into different thicknesses. With this study I noticed what dimensions users liked, giving me a rough guideline to design within. I gathered all of my data into categories. From those categories I identified trends. In addition, I created multiple diagrams to help me digest the data and to reference when designing. Designer Colin Beney joins the project to assist with the product form. Research based fictional characters with factual characteristics created to represent the different user types within a targeted demographic, attitude and/or behavior set that might use a site, brand or product in a similar way. After creating personas and defining insights we gathered all of our information and created a foundation to design upon. The criteria include: functional product attributes, feature set, timeframe, and mood board. Utilizing key insights we began to develop product and interaction design concepts. During this stage we generated as many ideas as possible both in sketch form and digitally. At this stage any idea is valid. Designers Beney & Brownhill overlooking all concepts. Designer Colin Beney Ideating Forms. Designer Ryan Brownhill Creating Interface Wireframes. After generating ideas and doing general ergonomics test we affinitized our concepts and began creating sketch models and interactive wireframes for user testing. Designer Colin Beney Creating A Sketch Model. Designers Beney & Brownhill Discussing Interface Flow and Product Form. Designer Colin Beney Refining sketch models. Using the sketch models and interactive wireframes we conducted usability testing on a variety of users from industry professional to the average consumer. Designers Beney & Brownhill preparing for user testing over coffee. Designer Colin Beney explaining the testing process to the user. Designer Colin Beney listening to the user's reaction to each form. Designer Ryan Brownhill receiving user feedback on interactive wireframes. Receiving user feedback from interactive wireframes in combination with product form. Professor Peter Damski of sound design giving feedback based on the layout of the device. Professor John Sisti of sound design giving feedback based on the size of the devices. Taking the knowledge gained from user testing we discussed and reworked our concepts for another round of user testing. Designers Beney & Brownhill critiquing the wireframe flow based on user feedback. Receiving additional user feedback based on updated wireframes and product form. Designer Ryan Brownhill receiving user feedback on updated wireframes. Designer Colin Beney explaining weight distribution and cord management to the user. Preparing sketch model for weight and cord management testing. After low fidelity prototype user testing we then moved to creating high fidelity protypes. This involved creating & printing 3D models as well as adding visual designs to the final wireframes. Designer Colin Beney creating a final 3-D model in Solidworks. Designer Ryan Brownhill adding the final visual design to wireframes. Designer Ryan Brownhill ideating styles for interface elements. Designer Colin Beney wet sanding the 3-D printed prototype. Designer Colin Beney sanding the 3-D printed prototype. Designer Colin Beney spray-painting the 3-D printed prototype.